Ten National Monuments Every American Should Visit In Their Lifetime! A monumental gesture is one of significance like having your likeness set in stone. Statues and monuments often depict a scene, tell a story, commemorate an act or memorialize people who have made an impact on history. The first monument in the United States was declared so by Theodore Roosevelt in 1906. It's called Devil's Tower and characterized as an igneous intrusion (huge rock) that reaches straight up into the sky offering a year-round challenge for vertical climbers. The majority of our national monuments are managed by the National Park Service (NPS), being places of unique natural beauty as well as historical significance. If you've started a bucket list of places to travel to and things to see, you may want to consider one of these National Monuments for your itinerary. California is home to a number of national monuments and treasures, like the Lava Beds, Devil's Postpile and the Muir Woods, named for John Muir whose devotion to nature was the catalyst for the establishment of the national park system. The Giant Sequoia National Monument is a relative newcomer to the list of national monuments. 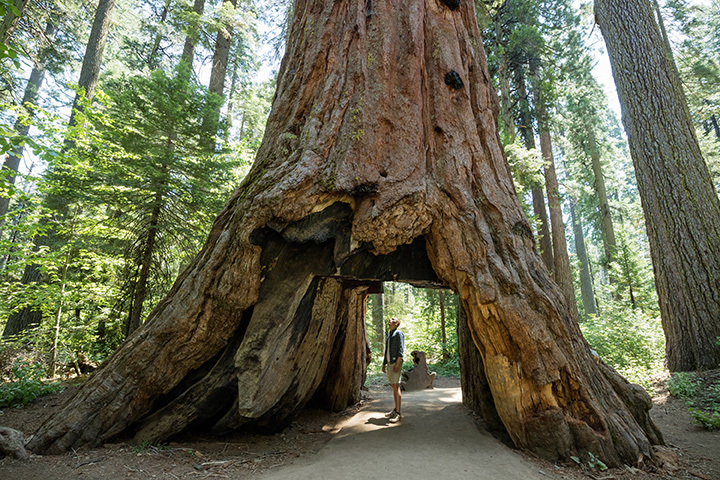 It was designated by President Clinton in 2000 to recognize a magnificent species of the world's largest tree that "grows naturally only in a narrow 60-mile band of mixed conifer forest on the western slopes of the Sierra Nevada mountain range in California." You'll get further on foot at the Canyon of the Ancients as "auto routes are few." See where Ancestral Puebloan and other Native American people made their home in what is now an outdoor museum. Head first to the Anasazi Heritage Center to get a better understanding of layout and you might want to grab a map as "marked trails are few and limited to specific areas." Lincoln's larger than life memorial was designed and constructed using different stones from different parts of the country to signify the reunification of the states. Marble from Alabama, Colorado, Georgia and Tennessee sits alongside Granite from Massachusetts and Limestone from Indiana. It's a melting pot of materials, that might have amused the man known for being a tinker and early adopter. Take a virtual walk through the monument online or use the National Park Service app to help plan out your day. It might look like the moon, but the substance responsible for this vast and eerie land is lava. Calvin Coolidge established this monument in 1924, calling it a "weird and scenic landscape peculiar to itself." It stretches 52 miles and is subject to change with the next major eruption, which "averages every 2,000 years and it has been more than 2,000 years since the last eruption." Call ahead to check on volcanic activity and have an alternate attraction on hand, like chasing the Idaho Potato Truck. The Battle of Baltimore in 1814 may not figure prominently in a study of American history, but it does have the distinction of having inspired Francis Scott Key to write "The Star-Spangled Banner." Fort McHenry is a National Monument and National Shrine where you can take a self-guided tour or if you visit in the summer months you can join a ranger talk or enjoy a living history exhibition. New Mexico is a state with a diverse and changing landscape where you can go from sunning yourself in the desert to skiing the northern slopes within the same day. It is also a state with a number of National Monuments, including White Sands, Tent Rocks and the Prehistoric Trackways National Monument created in 2009 to preserve the 5,280 acres that "contain footprints of numerous amphibians, reptiles and insects, including previously unknown species, as well as plants and petrified wood dating back 280 million years." Leave your inner archaeologist in the parking lot because fossil viewing is limited and most of the tracks are resting in safety at the New Mexico Museum of Natural History and Science. The Statue of Liberty is an iconic statue, given to the United States by France to commemorate the alliance of France and the United States during the revolution, but according to historians, the person who proposed the idea, Edouard de Laboulaye, also wanted it to stand for "the perseverance of freedom and democracy and to honor the work of the late President Lincoln." It opened as a National Monument in 1886 and is open for tours 364 days of the year. A ferry from Battery Park in downtown New York will take you to Liberty Island before continuing onto Ellis Island. Both islands are in the Hudson River between New York and New Jersey. You can get inside lady Liberty's head or at least walk up to the crown with advance reservations, but only if you are hearty enough for the climb up "162 steps on a confined spiral staircase." What's so exciting about being the third longest cave in the world? That's a common question, but the more interesting factoid is that although the cave has "more than 180 miles of mapped and surveyed passages, it lies beneath just three square miles of land area." You might call it an underground maze and a trip to Jewel Cave is more than a trip to one attraction because there are a number of distinct paths you can set off on, like a ranger-led Scenic and Discovery Tour, a Historic Lantern Tour or a Wild Caving Tour. Whichever path you choose first educate yourself about the conditions and be prepared to be amazed. The Grand Staircase is not a grand enough name for what is nearly 3,000 miles of landscape punctuated by red rock canyons that scientists are sure are at least 50 million years old. The cliffs, terraces, and canyons are a draw for archaeologists, geologists, historians and anyone thrilled by what mother nature hath wrought in the desert. Learn about the science behind the spectacle and check on the current conditions with the road report on their website or by contacting a local visitor center. Fans of fossils will love Fossil Butte because it contains "some of the world's best preserved fossils." The story of these creatures and their lives 50 million years ago is preserved in layers for the discerning visitor. Roam among the exhibits and displays in their visitor center or make your trip in June, July or August to get the benefit of ranger-led activities, like searching for fossils with a paleontologist at your side or a specialty hike geared toward children, birders or wildflower lovers!